A woman from 2nd floor just managed to catch the elevator yesterday as the doors were sliding closed. I would have waited, had she yelled. Instead, she poked her hand and arm through the magic doors and caught herself a ride to the next floor. I was happy to have friendly company. It's a short ride from the first floor to the third and an even shorter one to second floor. No call for small talk, really. But she talked the small anyway. People usually do. "I really should be taking the stairs, I know--" she began. In this situation, I usually offer up my own excuse--I'm old, it's been raining and the stairs are slippery, my bra's too tight and I can't breathe properly. Because that's the way this works. If one person rationalizes, everybody has to, so no one is obliged to feel self-reproach. Let one person fail to explain, though, and you've got a tiny room full of unaccounted-for compunction. That kind of guilt can rub off on another person, and I've already got all I can handle. I don't need to be carrying around extra, I'm-too-lazy-to-walk stranger guilt. Even so, in that split second when I ordinarily would have responded in kind, I just couldn't come up with an excuse that didn't feel like--well, an excuse. "I'm tired of feeling guilty for not taking the stairs," I said. "I have stairs in my house and I'm up and down them all day and all night long. And right now, I wanna take this elevator." She looked at me with love and said, "Well I do, too." Empowerment on the elevator. It was beautiful. Image, sign at Cornwallis Inn, Kentville, NS, Canada by Bill Davenport. You go. No need to make excuses (although I do the same thing). The stairs here are exceptionally terrible, though. 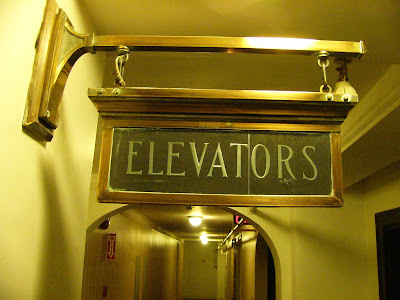 And if you see me on them, just know, I'd rather be on the elevator.